We are pleased to invite all alumni to participate in the upcoming meeting of the Alumni Book Club! 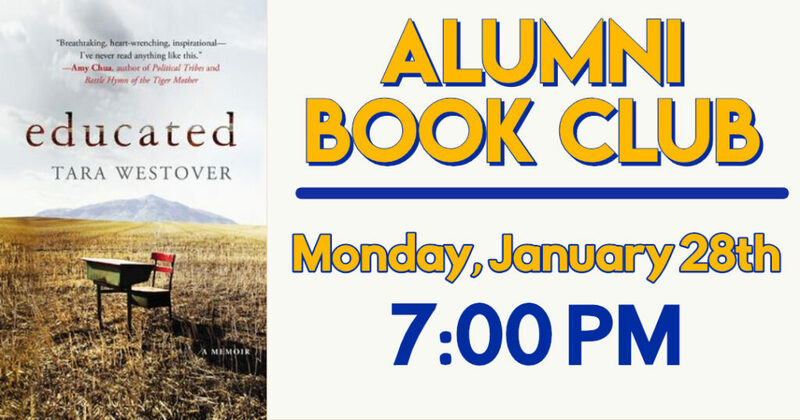 On Monday, January 28th, we will gather at Kellenberg Memorial at 7 PM to discuss our winter selection, Educated by Tara Westover. Harkening back to books like A Tree Grows in Brooklyn or the more recent Glass Castle, Tara Westover’s memoir Educated is a triumphant tale of overcoming a tragic upbringing and gaining a broader perspective on life thanks to learning and education. Westover grew up in the mountains of Idaho in a family of “survivalists” whose patriarch continually injected fear into the clan about the imminent approach of the end of the world. Stockpiling food, gathering ammunition, and clutching “head for the hills” bags, the Westovers distrusted all forms of societal influence: the children never saw doctors, they were never enrolled in school, and some of them didn’t even have birth certificates. In fact, only when one of Tara’s brothers “escapes” to college does Tara herself begin to imagine a life away from her home near Buck’s Peak. The story is a riveting one–all the more so because it’s true. In fact, when you read of the many frightening events that occurred in Westover’s life, it’s amazing that she even survived to tell the tale! This is a wonderful book about the difficulty in reconciling childhood memories with present experiences and future dreams. For those who are unable to attend the meeting in person, we will be live-streaming fully interactive coverage of the event. Please register using the link below by Thursday, November 24th. Any questions may be directed towards the Alumni Office at (516) 292-0200 x396 or [email protected].